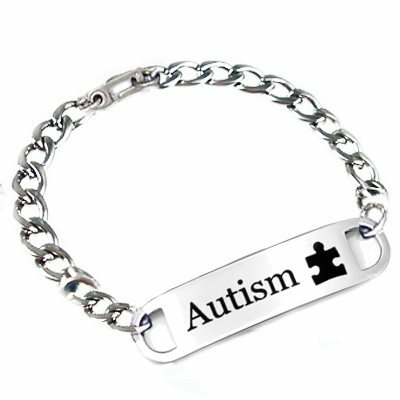 AUTISM awareness stainless steel medical identification bracelet offers durability and awarenesss. Our 1-1/2" x 3/8" stainless medical tag includes FREE laser engraving on the back of the tag. Price includes stainless steel medical ID tag pre-engraved Autism with Autism and lasered puzzle emblem & bracelet with stainless curb link chain, positive lock or lobster clasp at back of bracelet. No further discounts on this laser engraved product. 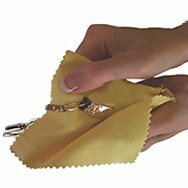 Sizing for this style: Take a snug wrist measurement, (no wiggle room) and add 3/4" for this smaller chain style. Wrist Measurement + 3/4 inch = Correct Bracelet Size. Laser engraving on Back. Please enter engraving in Capital Letters and leave spaces between words.